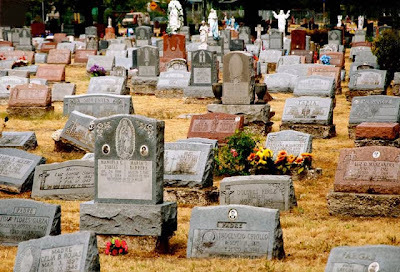 As many readers of Quigley's Cabinet are probably aware, it is not unusual in many places in Europe to reuse graves after a set number of years, during which the body has decomposed and traditionally the bones can be gathered together and placed in an ossuary. In Norway, the dead are given free cemetery plots for a period of 20 years, after which the family can pay for an extension. The bones and remains of the wooden coffins are left in place and new inhabitants are buried above them. But in the 30 years following World War II, the funeral directors of Norway made an environmental error. Thinking the practice to be more sanitary, they wrapped corpses in plastic only to find later that this kept them from decomposing. This led to a severe shortage of burial space, but the problem has been solved. "You may say wrapping people in plastic was the result of some pretty poor planning," says former graveyard worker Kjell Larsen Ostbye, but it has become big business for him. He has established a firm called Nomias, which injects a lime-based solution into the buried body to accelerate decomposition (DIAGRAM HERE). After obtaining permission from the family, the city of Oslo pays for the process, which takes only about 10 minutes per grave and leaves no trace. He has treated 17,000 Norwegian graves with hundreds of thousands left to go.